Preparation of DVD and HD soundtracks. Including many powerful features to simplify all recording, editing and post-production tasks, SADiE 5.6 is the most compatible workstation in the world, offering integrated exchange via OMF, AAF, AES-31, Pro Tools. Whether the rest of your facility uses Apple or Windows computers, SADiE can network and share projects with them. Audio files may be recorded in a wide range of formats, including WAV, BWF, AIFF, and even SDII onto Apple HFS and HFS+ drives. SADiE's open architecture allows third party DirectX and VST plug-ins to be used within the SADiE software mixer, which complement the very high quality inbuilt processes such as EQ and dynamics control. A long-standing relationship with CEDAR audio, the best audio restoration specialists in the world, has resulted in the CEDAR algorithms being integrated into SADiE's EDL and mixer for very fast and flexible restoration. 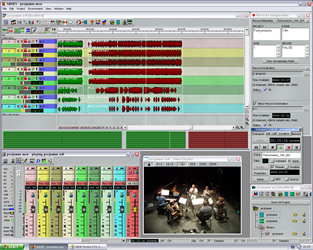 Unlike less professional systems, all edits, levelling, mixing, and processing are performed in real time. This results in an amazingly fast user interface which positively rewards creative and artistic experimentation - knowing that a quick undo (up to 50 steps) is all that is required to step back. And for those of you who like to edit by ear, SADiE's audio scrub algorithms are the best in the industry. A wide range of control options are available. SADiE 5 software supports mouse and keyboard-driven operation, SADiE's own hardware control surfaces, and may digital consoles or controllers such as those from Behringer, Mackie, Yamaha, SSL, and many others. Failsafe recovery of edits and mixes in the event of power loss. Whatever other equipment is in your studio, and however you prefer to use an audio workstation, SADiE 5.6 offers you a solution to the way you want to work. If you haven't experienced the speed and flexibility of SADiE in use, nothing beats seeing it in action. All SADiE dealers are trained and able to demonstrate all aspects of SADiE in real-world facilities, so don't hesitate to contact a SADiE dealer or representative for a demonstration.